The Paris Salon was the ultimate tribunal where French Art was judged during the 1800's. Thousands of artists submitted paintings, sculptures and other forms of art every year in hopes of being accepted.Being chosen or not could break or make an artists' career quite literally. Over the decades, the tribunal that selected the works had become a self-perpetuating institution with sclerotized ideas of what constituted Art- both in regards to content ( mostly mythological, classical or historical grand scenes with some sort of moral) and style (no trace of brush strokes and soft chiaroscuro transitions). In 1863, driven by the outrage that resulted from the rules imposed by the Count of Nieuekerke and which resulted in controversial refusals, Napoleon III ordered the opening of the Salon des Refuses: an exhibition that was to display many of the works refused by the official Salon. Napoleon III knew how to distract the population from his dictatorial government after all. This book follows the fortunes of two painters that were deeply involved in the Salon controversy: Meissionier, a very succesful painter of excruciating detail and accuracy; and Manet, a representative of a more direct and modern style. In a very accessible style that flows quite well, the book delves into the state of French Art of the nineteenth century. The panorama that emerges is a lot more nuanced than what we normally understand by the rivalry between impressionism and classicism, the mere confrontation between the "new" and the "old" which ends in 1874 with the Impressionists Exhibition. The author reveals that Manet, for example, used very classical models (Titian, Tintoretto) for his first paintings. Also, Manet valued the Salon and kept presenting his paintings to be juried year after year, even after becoming the hero of many an impressionist. Meissioner on the other hand struggled to create a modern vision as well despite the fact that his enormous success stemmed from his anachronistic and greatly detailed canvases of a somewhat dutch inspiration. The cast of characters that surrounds these two masters is the subject of much literature: Courbet, Baudelaire, Whistler, Monet, Zola, Fantin-laTour, Ingres, Degas, Bougereau and the "pompier" painters, an endless row of royals, politcians, gallerists and collectors. 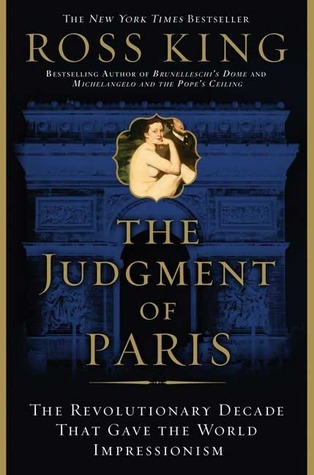 "The Judgment of Paris" does a phenomenal job of integrating all these pieces in a coherent narrative. I particularly enjoyed the glimpses into the lives of the painters, how young some of them were when they created some of their work, how poor or rich or inbetween some were, how they debated with their own place in time and art, how some died young and how some fought, escaped or resisted the Franco_Prussian war, the siege of Paris and The Commune. I thought it was fascinating and far form the "finished" product and narrow portrait of self-determination most biographers produce. For anybody interested in art and history, the book is well documented and seamless. Not just a collection of facts in search of a story but a good narration.If you are a painter, this is a must read and the only thing you will regret is the time you won't be painting waiting to put it down. I now have a new book to add to my list... Thanks, Jose!! !